For years, fried shrimp - especially breaded and fried shrimp - have had a terrible reputation. Restaurants everywhere served tiny, dried-out shrimp surrounded by a thick layer of greasy batter or breading, made palatable only by a big serving of cocktail sauce. Done right, and they're delicious - moist and flavorful on the inside, surrounded by a thin crunchy panko coating. Shrimp are sorted and sold by "count," meaning the average number in a pound. The higher the number, the smaller the shrimp. 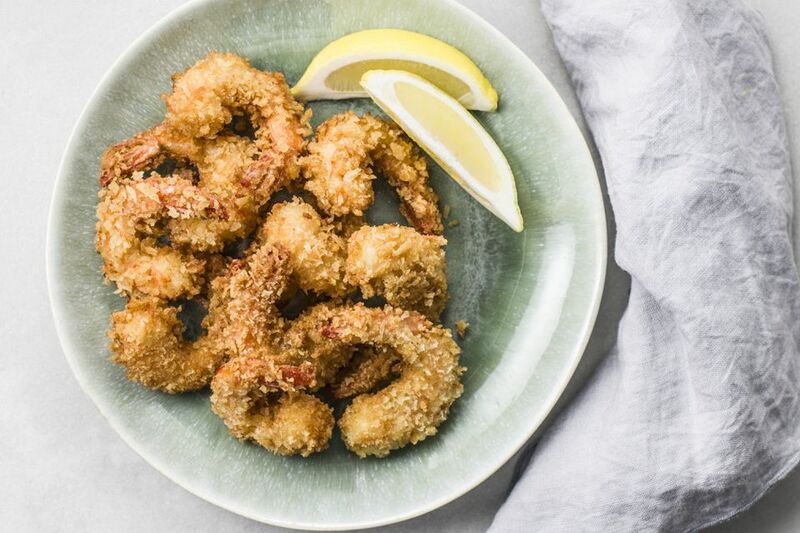 For this recipe, choose ​medium (31 to 35) or large (21 to 30); that way the shrimp will cook through at the same rate that the panko browns, so they'll remain juicy. If the shrimp are in the shell, peel, and devein them. You can leave the tails on for looks if you like, or remove them. Sprinkle the shrimp lightly with salt. Place the flour in a small shallow dish. Beat the egg with the yogurt or milk, until thoroughly combined, and pour into another small shallow dish or bowl. Place the panko in a third dish. Choose a heavy-bottomed pan large enough to hold all the shrimp in a single layer. Pour enough oil into the pan to reach a depth of at least 1/2-inch (3/4-inch is preferred). Heat the oil over medium-high heat to 360 F.
As the oil heats, coat the shrimp evenly with the flour in the first bowl. A few at a time, transfer to the egg mixture and turn over to coat with egg. Finally, transfer to the bowl with the panko and coat the shrimp with an even, thin coat of crumbs. When the oil is hot, carefully add the coated shrimp in a single layer. Cook for about 2 minutes, or until the first side is a deep golden brown. Turn the shrimp over and cook an additional minute or 2, or until the second side is golden brown. Remove the shrimp and place on a rack or paper towels to drain. If using paper towels, remove the shrimp after a minute or two so they don't reabsorb the oil. While these shrimp are good on their own, they're even better with chermoula (spicy herb sauce), red table salsa, or the dipping sauce from crab rangoon.